Though AMP has become quite a household name for avid cloth diaperers, it is neat to be able to share with you a great product from them, but also a little bit of the story behind the company. With AMP being such a huge name (making thousands of high-quality cloth diapers--everything from fitteds, to all-in-ones, to pockets & more), I was pleasantly surprised to find out that these diapers herald from a mom-founded and owned company just two provinces over from me, in Winnipeg, Manitoba! 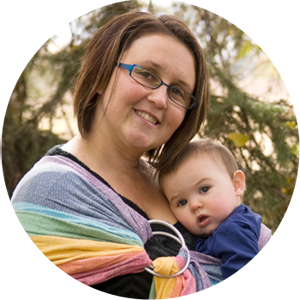 Annie, mom to five fantastic kids (aged 2-17) first began her cloth diapering in the 90s with her oldest daughter. Frustrated by the failures she experienced with typical cloth diapers (everything from old fashioned styles, to hand-me-downs, to department stores splurges), Annie got out her sewing machine, determined to come up with a style that would work for her newborn baby in 2003. At the urging of her friends, she began to make more and more diapers for people she knew, and quickly her foundling company exploded! AMP Diapers--the short name for Annie Marie Padorie's (after the nickname Annie's grandfather gave her as a child)--have now taken off as a full-scale manufacturing process, now made in a factory in Winnipeg where workers love their jobs, are paid full wages, and work in comfortable and safe conditions. When you buy AMP Diapers, not only do you get a great product, but you can also feel good about supporting domestic inventory and buying into fair and ethical business practices. I've reviewed an AMP Duo Pocket Diaper before from another local shop--I loved it then, and I still love it now. So, I was thrilled when Annie from AMP got in touch with me and said she would send one of AMP's Hemp Fitteds my way. This is great as it is number two in our summer series, where we are highlighting breathable, natural fabrics favorable for these warmer months. 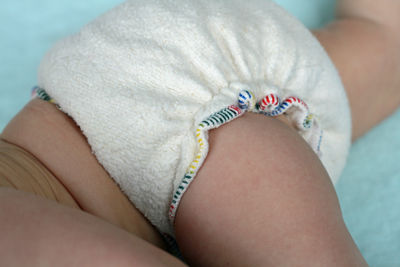 These fitted diapers are available in two sizes, Small (8-16 lbs) or Large (15-35+ lbs). For 9 month old baby Aurelia, we received the Large Hemp Fitted and have been absolutely loving it! The minute I opened the package on this diaper, I could tell that it was made with high quality materials and construction. The material itself is made of two body layers of hemp fleece (55% hemp and 45% cotton), which makes it super soft, natural, and breathable. 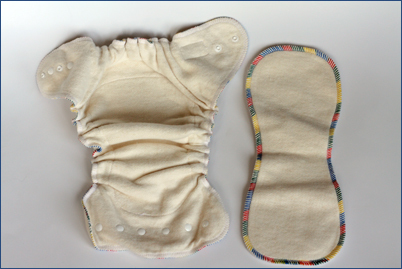 Additional to the two layers all over, this diaper is sewn with an extra layer already in the wet zone, to make it more absorbent. The thing I loved most about this diaper is that it additionally comes with an extra three-layer booster pad. So, altogether, if you use this booster on top of the already padded wet zone, you get 6 layers of absorbent material where it counts. 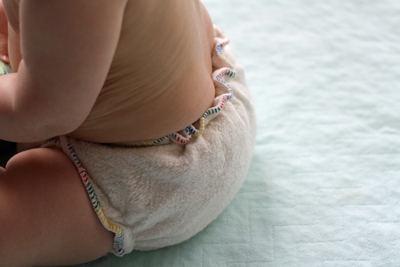 The thing to remember about a fitted diaper is also that, when worn with the cover, the entire diaper itself actually adds towards the absorbency (absorption is not only contained to the wet zone). Honestly, when super soaked, this diaper remains MUCH trimmer than a super-soaked, bulky disposable diaper. 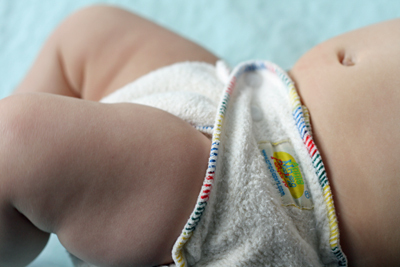 Because it is made with 100% natural materials, this diaper does need to be prep-washed before you begin to use it. This is because natural fibres like hemp, bamboo, cotton, etc, are naturally coated with their own oils which will make them non-absorbant if you use them right out of the package. Washing them 3-5 times before use with your regular diaper or baby laundry will slick those oils off the fabric, exposing their pure absorbent capabilities when you finally use the diaper on your baby. I washed this three times before using it and only continue to see the diaper get more "primed" and effective as every wash goes by. The materials themselves, although they diminish somewhat in their soft, fluffy quality, have an amazing, close-knit, durable quality that continues to develop. For all the Canadians out there, it almost reminds me of the durable quality of the old Hudson's Bay blankets you may have seen as a kid--only much, much softer, of course. But the tight-weave and super absorbent qualities do make this a diaper that Baby can truly wear coverless for the majority of the day, especially when around the house. Even when coverless with a heavy soak, this diaper will still give you time to feel slight dampness before it ever begins to wick & spread, which would give you time to change baby or place them on a waterproof surface. Aurelia wears this all the time around the house (coverless), and it (and the other fitteds we've been trying) have made a HUGE difference in improving her teething rashes. I love that her skin isn't humid and clammy when we take off this diaper. I was shocked to discover, too, that it's actually become one of my favorite naptime diapers for my little super soaker. All my covers fit well over its trim fit, and when covered, this hemp fitted can absorb and absorb and absorb, even for 2-3 hour naps. I am certain it could go all through the night (for the brave at heart), although I personally would add a "stay dry" layer just for comfort against Baby's skin. We've never had a leak or any wicking problems with this diaper--more than I can say for some of my pocket diapers, that's for sure! The other thing I love about this diaper is the soft, covered elastic that is in the legs and waistband. Because the elastic is embedded into the soft fleece layers, it keeps a great fit but also never leaves any sort of red marks like some of the PUL-covered elastic can do (especially when it's hot/humid out). In terms of the structure and design, the waist snaps have a crossover fit, and the seams are finished with a cheerful, rainbow serging. Although fitteds may not be best for every scenerio out there, I would feel comfortable using a fitted diaper like this 80-90% of the time in our household. It is a great investment that keeps its quality over time and that is natural and friendly to baby's skin. With hemp also being the most environmentally-friendly textile to produce, and with the factory located on Canadian soil, this is also a quality environmental and ethical choice. Overall, I highly recommend this diaper, and if I was starting my stash all over again, I would definitely lose a few pockets and stock up on at least a half dozen of these guys instead! Also, if you make a purchase from the online AMP Diaper Store totaling over $50, use coupon code cdcontests to receive 10% off your total order! 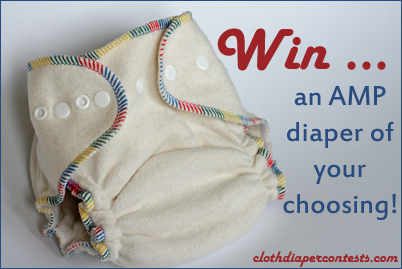 AMP Diapers is also offering one lucky winner any AMP Diaper of your choice!! Make a purchase from the AMP Diaper Store and allow yourself one extra entry per item purchased! Final details: I received no financial compensation for this review or giveaway, though I did receive the sample items free of charge. All opinions shared are my own, and I was not persuaded to share anything other than my own thoughts. Other users may have different experiences with this product than what I have shared. This giveaway will end on June 30, 2011 at 11:59pm MST and is open to residents of Canada and the USA only. Winner will be chosen randomly using random.org’s services. The winner will be contacted by email and will have 48 hours to reply before a new winner is chosen. The prize will be supplied and mailed out to the winner by the sponsor of this giveaway. I like CDCG on Facebook! I would like to try the Kissaluvs fitted diaper! I liked Cloth Diaper Contests and Giveaways on FB. FB: Taci M.
I liked AMP Diapers on Facebook and wrote on their wall. FB: Taci M.
I follow @CDcontests on Twitter. 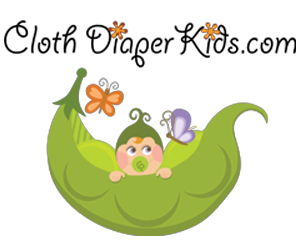 I voted for Cloth Diaper Contests and Giveaways blog on picket fence blogs. I would love to try a hemp fitted! Your review made me really want to try hemp. I love bamboo but never tried hemp yet. I am a fan of AMP on facebook already, and a big fan of AMP in my diaper stash! I voted for you on the fence! I'd love to try their hemp fitted diaper...looks great for overnight! I'm a follower via GFC! I'd love to try the AMP duo pocket in large! 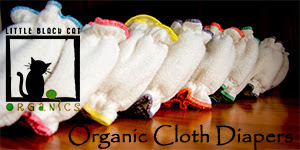 I "like" Cloth Diaper Contests... on FB! FB follower as Karhma Dent. I'd like to try the hemp fitted. I follow you on twitter as @Dracodrake. I like Amp on fb as Karhma Dent & thanked them for the giveaway. I voted for you on PFB-6/20/11. already follow AMP on FB, left a comment thanking them for the giveaway! I'd like to try an AI2!!! I Like Cloth Diaper Contests and Giveaways on FB! 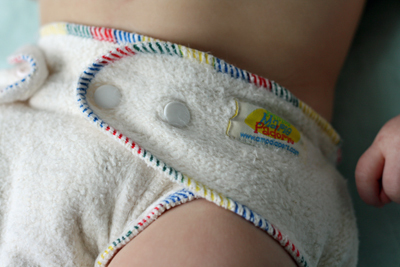 AAF of AMP diapers on FB- showed some love! I "Liked" Cloth Diaper Contests and Giveaways on Facebook. Facebook ID is April Cocco. I "Liked" AMP diapers on Facebook. Facebook ID April Cocco. Followed blog with my twitter account. I 'like' Cloth Diaper Contests and Giveaways! I 'like' AMP diapers and posted on the wall. I'd like to try a hemp fitted. I receive email updates from the CDC&G blog. I Visited the AMP website and love the Hemp fitteds. I follow CDCG via GFC. I would love to try the AMP Hemp Fitted! I like CDCG on facebook. I like AMP on facebook. I follow CDCG on twitter. If I win, I'd like a Stay-dry AIO! I like AMP Diapers on FB and left a comment. I'm following @CDContests on Twitter. I'm following @AMPDiapers on Twitter. I subscribed to your e-mail updates. I'm following via Networked Blogs. I voted for you on Picket Fences! I added your button to my blog (entry 1 of 3). I added your button to my blog (entry 2 of 3). I added your button to my blog (entry 3 of 3). I blogged about the giveaway (entry 1 of 3). I blogged about the giveaway (entry 2 of 3). I blogged about the giveaway (entry 3 of 3). Would like to try the AMP duo pocket diaper in red please!